Looking for a challenge? Telaga Waja River Rafting should be your first choice for the best rafting experience in Bali. For an adventure on first class rafting in four classes of rapids. The water is not only clear and clean like crystal water but also one of the longest rafting trips in +16 km for 2,5-3 hours journey at level III-IV class. Feel the adrenaline rush on this whitewater rafting adventure on the Telaga Waja River. Get instructions on paddling and safety procedure from an expert rafting guide. Discover the scene of rice paddies, rocks, cliff, and mountain valleys. See Balinese everyday life in its natural life. Enjoy a refreshing shower and an Indonesian buffet lunch. 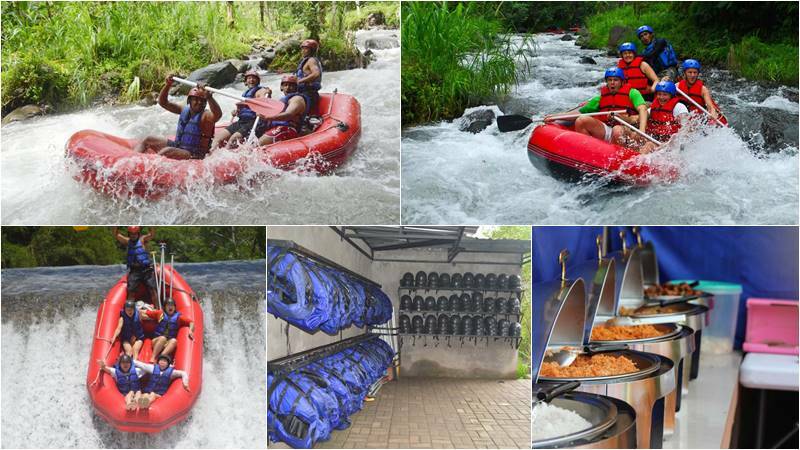 Telaga Waja River Rafting is one of the most extreme kind of adventure you can experience in Bali, located in the sub-district of Rendang, Karangasem. The Bali rafting company belongs to a local community and employs local professionals with over 10 years of experience. Bali White Water Rafting at Telaga Waja is very safe, with our professional river guide, who has been experienced for more than 10 years. In the handling of domestic and international tourists the rafting staff are truly professional and friendly. The team keeps expanding it staff with foreign language training in several major languages to ensure that guests feel comfortable while enjoying the Telaga Waja River river rafting. The starting point for Telaga Waja white water rafting is in the village of Muncan and will be completed in approximately two hours at Banjar Pakel, Gegelang village, Karangasem. It takes about 1 hour 45 minutes by car from Kuta area and 1 hour 15 minutes by car from Sanur. The rafting route is approximately 16 km long and takes about 2,5-3 hours to complete the 3-4 grade trip, and is known as the fastest river for whitewater rafting in Bali. Located in East Bali, you can enjoy a place where the citizen has kept in touch with their traditional way of life. The Telaga Waja River is a spot to enjoy the magnificent views of hidden waterfalls, picturesque jungles, traditional rice terraces and tropical birds serenading. The Telaga Waja River provides you with access to four different rapid classes. We hope you are prepared for an excitement! The rafting ends with a huge jump of four (4) meters at the Bajing Dam water sliding, but don’t worry that even for beginners and children 7 years old it’s safe. The restaurant is easily accessible from the river and is in the middle before reaching the parking lot. It overlooks the river of Telaga Waja, forest, valleys, and rice paddies make for great comfort during lunch after the Bali rafting program is over. Soap, shampoo and towels are provided with bath amenities and changing rooms. The Telaga Waja River Rafting combines adrenaline pumping adventure with lovely surroundings, great service and family-friendly outdoor activities. It’s an adventure you will never forget; book for Telaga Waja Rafting today and take off on the leisure experience of this lovely river in the Eastern part of Bali. 09.30-09.40 : Arrive at river rafting location at Muncan village, Karangasem. 13.00-13.15 : Reach the finish point. Take your towel, shower and changes. 13.30-13.45 : Indonesian buffet lunch at the restaurant. 14.15-14.30 : Transfer back to your hotel. *) the above trip itinerary is rough timing only, change depending on the pick-up point. Why Should You Choose Telaga Waja Rafting? Avoid extra hassle, our restaurant is a minutes away from the finish point. Enjoy yourself without being subjected to many steps. The pick up point outside Kuta, Seminyak, Canggu, Legian, Tuban, Nusa Dua, Jimbaran, Sanur, Denpasar, & Ubud will be subject to a transport surcharge.